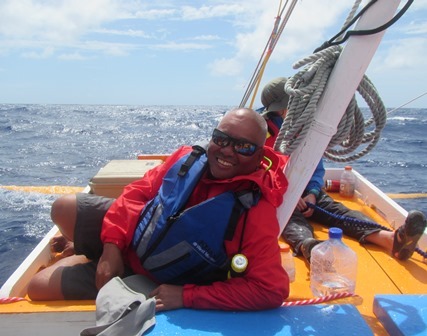 Alson Kelen captained a second voyage of a Waan Aelon in Majel (WAM) ocean-going canoe from Majuro to Aur Atoll, 60 miles to the north, in June, 2015. Read the story: Scientists intrigued by Marshallese navigation. Below is a video taken by Alson, Director of WAM. Ten years ago, the Local Government of Ailuk Atoll commissioned WAM to design and build a unique style of canoe. The council had decided the atoll was in need of a workhorse that would complement the many traditional canoes that were in everyday use on the atoll. Ailuk’s islands run along the western side of the atoll in a north-south direction, while the eastern shore is mostly just coral walls. The prevailing north-east winds make this layout of the islands perfect for reaching (sailing with the wind on the beam) between the main island of Ailuk Ailuk, the northern community of Enejelar, and the uninhabited islands in between. While these middle isles no longer have villages, they are often visited for the harvesting of coconuts for copra, which makes for a heavy load. It was decided that a catamaran-style, double-hulled canoe could support a strong, wide platform, as well as provide double the amount of storage in the hulls. Ailuk officials approached the Embassy of the Republic of China (Taiwan) and was given a grant to pay for the building of the catamaran. And so it was that the instructors and trainees in the 2004 program built the canoe, giving it a bright blue and white paint job, with contrasting red lashings. The canoe was delivered to Ailuk, where it was immediately put to service. But, as the years slipped by, even the sturdiest of objects will succumb to the elements of a low-lying outer island. And so, in 2013, a grant was successfully sought from the Ministry of Internal Affairs and a team was chosen to do a refit of the catamaran. The RMI National Training Council also assisted with funding for the project. 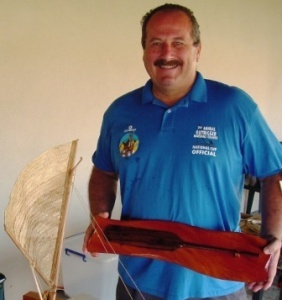 Team leader of the refit was Rice Snight, a champion canoe sailor, who over the years has often come to Majuro to compete in the annual National Cup. The refit took a number of months, but by early 2014 was back in action on Ailuk’s lagoon. Dennis Alessio spent 20 years researching canoes and reviving the art of building and sailing the culturally-important treasures. His efforts included the development of the Waan Aelõñ in Majel program before he left the Marshalls in 2007. Featured below is a three-part series by Giff Johnson published in the Marshall Islands Journal shortly after Dennis left the RMI. To read the series in pdf format, click here. Below are the jpgs of the pages in the Journal. 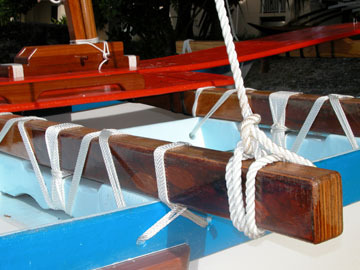 Each part of a traditional Marshallese canoe has its own specific name. Below are the names in Marshallese and English. Below these words is a description of the lashings on a canoe. Elmakwot: This is the very first lashing we use on this canoe which is actually temporary, holding parts in place while they are fine shaped or so they remain tight while the permanent lashing is executed. The ekkwal is threaded through the two holes that tie the certain parts together six to eight times, or as many as times as will thread through the hole. The lines is then knotted to hold it in place and a hardwood wedge (katok) is driven under this temporary lashing, pulling the parts tightly together. When lashing the main hull the elmakwot are places about every 6-8 lashing holes. This beginning of this lashing is the same as the emem, explained in the next sequence, but without the lebout (figure 64). Emem: This knot lashes the main hull together. 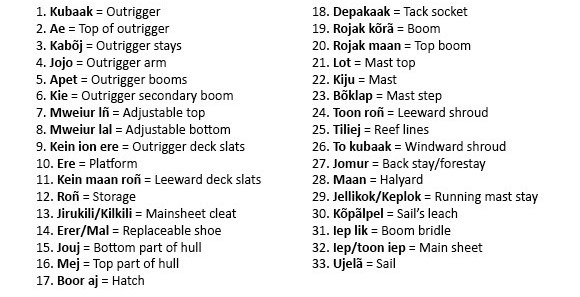 This same type of lashing is used for the following lashings: to tie the planking of the main platform (põtak) together, well as to the side rails and the main booms; the sacrificial keel (erer) to the bottom of the hull; all of the parts of the lee platform (kein maan roñ) with the main hull; the mast step to the top of the põtak; the mainsail sheet cleats (jirukli to the side of the hull. The same technique and style of lashings used on Enewetak are similarly used as described on Likiep (Alessio 1990), Namdik Atoll (Alessio 1991a) and Ailuk (Alessio 1991c) with the exception of some specific name differences between the Ratak and Ralik dialects. An added exception is that the style of lashing used in Namdik, tying the mweiur to the apet and kie is used in Enewetak for lashing the crosspieces (kein ioon ere), which support the secondary platform (ere) to the apet and kie. 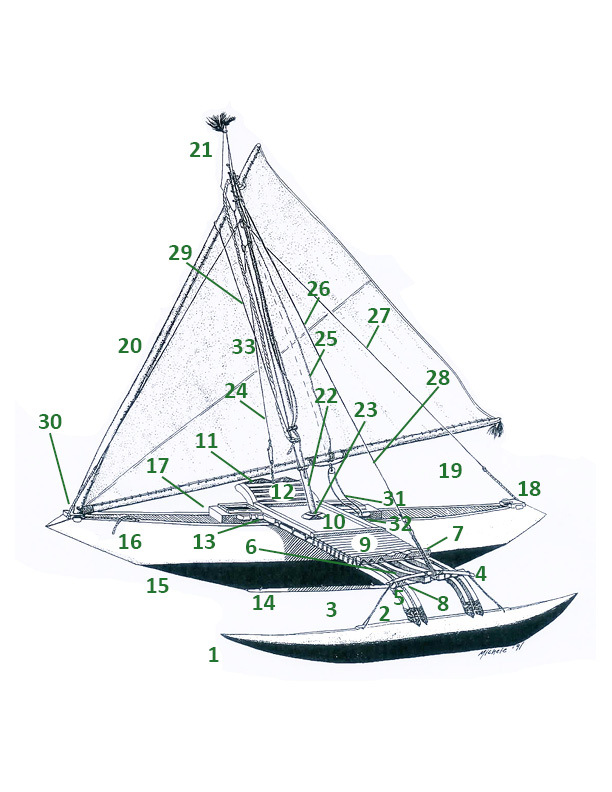 Layout of the jojo (the outrigger lift lashed to the kie) and kabõj (The lashing which ties the ends of the jojo to the top of the kubaak). Kabõj: This lashing is tied around the groove carved into the end of the jojo before going down and through hole drilled at the outer ends of the ae. The number of wraps depends on the builder, usually 6 to 12 on a canoe this size (figure 70a). The entire lashing is wrapped around itself lebout style b. This is the lashing which, integral with the jojo, acts as the shock absorber when the kubaak moves up and down with the waves. Ino in Jõbarbar: Lashing which ties the two sail booms together. At the kõpãlpel end of the rojak maan, from the end and in the side an ekkwal ring is looped through about 20 wraps and then wrapped around itself using the lebout technique, tying the bottom of the loop together so that the rojak okra can be lashed to it (figure 72a). The end of the rojak is completely wrapped with coconut coir to the loop. Ino in erer: Five holes large enough to accept six wraps of lashing line are drilled into the erer. One in the center, two approximately 1 jetan (7in [18cm]) from both bejõñ line, and two more about 4 ar (3in [7.6cm]) from both ends. This same procedure is done in the bottom of the hull with the exception that the outer holes are drilled one makwõj (1in [2.5cm]) closer to the outer ends of the erer in order to reduce fore and aft slippage of the erer while beaching. In other words the outside lashings are at an angle and not exactly vertical. The holes are two ar (3.8cm [1.5″]) apart at the seam. The lashing knot is the same emem type used for the main hull. Marshallese canoes became a large part of Rachel Miller’s life after she first arrived in RMI in 2005 as a WorldTeach volunteer, working on the remote Namdrik Atoll. Not wanting to leave the Marshall Islands immediately, after the teaching year ended she joined the WAM team to be its Program Administrator, working under Alson Kelen as Program Manager and Dennis Alessio as Program Director. 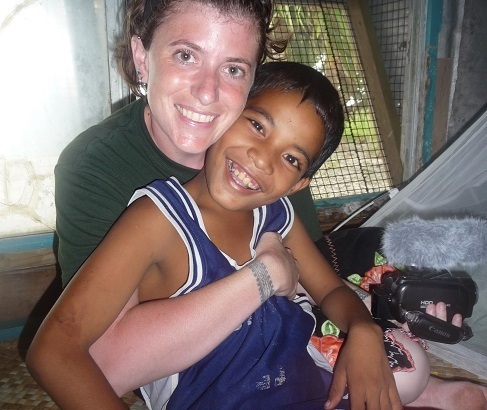 Rachel’s next career move was to work for the East-West Center in Honolulu for three years. In 2013 she moved to Bloomington, Indiana, to pursue a second Master’s degree in Public Affairs from Indiana University. 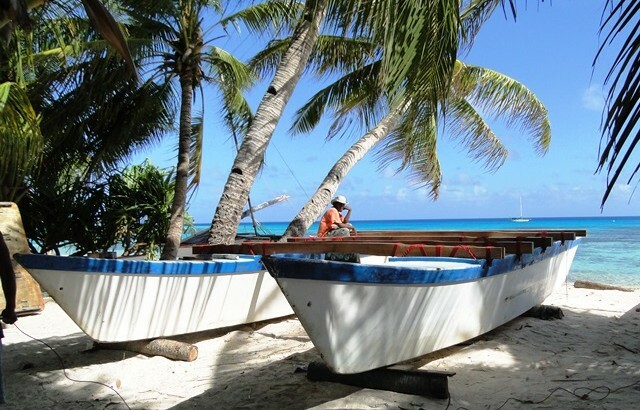 Wa Kuk Wa Jimor – Marshallese Canoes Today from Rachel Miller. The canoe tradition is one of the foundations of Marshallese culture. In the past it was the key to survival in the Marshall Islands, and it continues to embody many of the key values and practices of traditional Marshallese culture. “Wa Kuk Wa Jimor – Marshallese Canoes Today” (55 min, 2011), by Rachel Miller, introduces the tradition of the Marshallese canoe—including the history, types, and technological innovations of the canoe—and the complex connection between the canoe and Marshallese culture. It looks at the state of the canoe tradition in three locations in the Marshalls and explores the future of the canoe tradition. The film features interviews with elders and experts from the Marshall Islands, and is in both English and Marshallese. “Wa Kuk Wa Jimor – Marshallese Canoes Today” was funded in part by the Hawai‘i Council for the Humanities (HCH). To thank the government and people of Taiwan for all they do for the Marshall Islands, in 2005 President Kessai H. Note commissioned the Waan Aelõñ in Majel program to build a canoe that would be presented to then President Chen Shui-bian. Following tradition, the canoe hull and outrigger float were built from the wood of a breadfruit tree and the outrigger booms and sail booms were built using wood from the Lukwej tree, which is a member of the mangosteen family. According to WAM Director Alson Kelen: “In the olden days, it would take up to a year to build such a canoe, but we made this one in just a few weeks.” Two sails were made for the canoe: One from cloth and one from natural fibers. 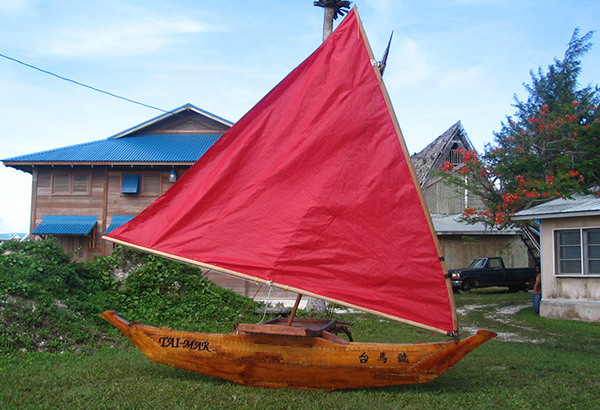 “It was the first woven sail that was used by WAM or maybe any other Marshallese in the last 100 years.” The WAM team used the cloth sail for sea trials. The canoe was delivered to the Republic of China on a Taiwanese military vessel that was visiting the RMI around that time.